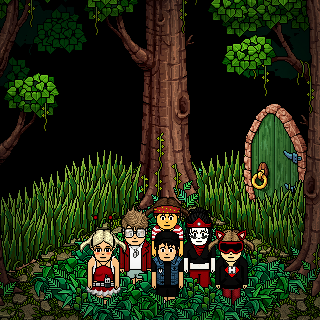 Celebrating Friendship Day with HabboQuests! Swiper no swiping! Free boots for our fellow explorers! For everyone who believes in superheroes such as Doodlesaur also known as Thor. Welcome to Legion Of Heroes, We are a virtual community who work to recruit new members, Host games, and have fun. Join today to be apart of all the fun. We pay all our members 10-50 habbo credits when ever they have bobba it. "But as the last station is also the first station, our destiny is that we will meet again"
The people in this badge are the official mods of Kieran's rooms! Follow directions of anyone in this group, feel free to ask them for help! Everyone with this badge has rights in the maze/game rooms! Come here and shop! Flick switch and ask for prices if you need. Val has entered the building!